Hey friends! Come on in and take a look around my first ever home tour. Our home is decorated for Fall and I’m excited to welcome you in. I don’t pick up for everyone so that goes to show how special you are to me. 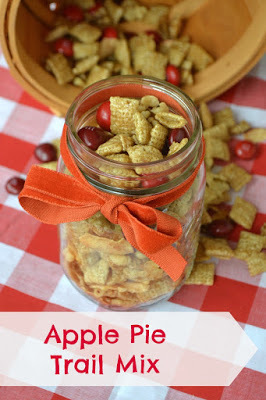 Take a look around and then visit some of the other bloggers joining in on the Fall Home Tour Blog Hop linked up below. I can remember the first few years Mike and I were together and we would take what little extra money we had around the Fall and Winter holidays to buy a few new decorations. As time went on and I became more creative with crafts AND our budget I was able to fill our home with decorations to fit our style. Decorations that didn’t cost an arm and leg but also weren’t so cheap they couldn’t be used for years to come. The past couple of years I have unpacked our holiday decorations and felt appreciative of the years when we didn’t have it all because it taught us what we really wanted. Does that make sense? Things mean so much more when you work harder for them. We hardly have any of the decorations from our first few years together because they were a mix of items that didn’t go together or were cheap paper and plastic decorations that we tossed at the end of the season. What are you waiting for? Step on in and take a look around. Greeting you at the door is a tulle and leaf wreath I made a few years ago. We don’t have many trees with changing leaves in Florida so I have always loved this wreath and continue to get lots of compliments on it. Every Fall I also have to buy mums for our front porch because I can’t resist their fall colors. I think mums are beautiful with all of their tiny petals. I changed up the decorations on our faux mantel for Fall. I combined oranges and creams with the aqua framed mirrors. The complimentary colors make for an eclectic Fall color scheme that catches my eye every time I walk into our living room. Once my young babes are older I am excited to be able to add more decorations to the bottom shelf of the mantel but with little grabby hands it doesn’t make sense to do it now. I tried putting a few empty baskets on the shelves and even those were tossed about every time they laid eyes on them. Over the years I have purchased small pumpkins from Walmart, dollar stores and craft stores. I don’t like spending more than about $1 on them. I can’t see spending hundreds of dollars on fake pumpkins which will only be on display a few months of the year. I shopped my house for some other rustic accent pieces and rearranged. I am a notorious rearrange – a cheap way to make a difference. I found this feather canvas at Ross for $10. It was the perfect size and tied in all of the colors in the room. I went back and fourth in my head over buying it but in the end it came home with me and I am glad it did. I think it ties everything together perfectly. On the dresser under our TV I made an eclectic little pumpkin patch. I gathered all of my little pumpkins, my fabric pumpkins, chalk painted teal pumpkin and vintage tools and utensils. When I pulled out the decorations I felt like a pumpkin fairy waving my want and adding pumpkins everywhere I went. Adding a few small pumpkins and a candle to the hanging rake we have gave it a whole new wow factor. We usually use it to hang our keys but right now it is holding much more precious cargo. I hung my flannel shirt on the hook next to it for cool morning when I need long sleeves to walk my boys to the bus stop. The shirt once again tied in the pops of teal and aqua. Yellow mums speak my love language. Those delicate little petals opening into perfect blooms. In the small somewhat awkward alcove we have along the wall leading from the living to dinning rooms I added more Fall décor. I hung a simple burlap wreath and added in a wooden painted ‘harvest’ sign I made a few years ago. Once again fake leaves at their finest. I picked a large pack of fake leaves up at the Dollar Tree last year or the year before that have a glossy look and really do look real. I filled a wooden bucket with vintage books from a garage sale and placed them along with the fake leaves on a wooden tray. Remember that pumpkin paint color I changed in my craft/office area? Well guess what!? Our dining room is painted in the same color and I haven’t found the time to change it yet. The good thing is that it lends itself to Fall and our tablescape so I am not in a rush to change it for a few more months. I bought a bag of apples and paired them with more pumpkin orange decorations in the kitchen and dining room. With the orange walls I kept our tablescape and kitchen island light by using burlap runners and white pumpkins. I recovered two throw pillows in black and cream plaid flannel and tossed them in an unused chair at our table for a cozy Fall feel. I decoupaged the top of a pie box in a brown, orange and cream plaid print paper and am using it to store the tabletop decorations during meal time. Sorry to disappoint you but we don’t actually eat with the table set like this. It seems like a lot of work by the end of Fall as I set up and take down the center decorations but my kids would be eating the apples, possibly trying to eat my fake pumpkins and quite honestly trying to use the chargers as plates. Not many things are safe with two young boys and two toddlers around. We signed our two older boys up for Fall baseball and if I see another baseball being thrown around in my house I might make them disappear forever. How perfect are these pumpkin plates? I found them at Walmart and couldn’t resist. They were only a few bucks each and I bought four. Fall is a season of reflection and thankfulness for many. I am no exception. I tend to reflect back on everything that happened throughout the year and feel thankful for all the good. I am always most thankful when our home is filled with family and we are joined around the table in laughter. Thanks for stopping by and joining me through a tour of our home. Next time I will have everything decorated for Christmas and show you around a few other rooms in our home. 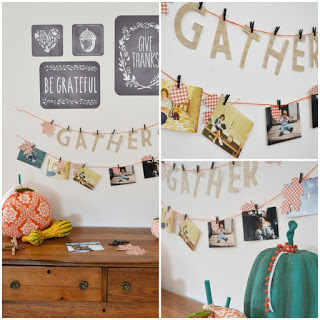 Have you started your Fall decorating yet? Don’t forget to stop and visit some of the other homes participating in our Fall Home Tour Blog Hop! There are some amazing homes and decorating ideas! I love the feather canvas and the colors you used aqua and orange just Beautiful!! I enjoyed your tour thank you for sharing. I never would have thought to put aqua and orange together and it totally rocks! I love it! The feather canvas was a real find! I adore your blackboard with the faqll banner too!! I love your touches of aqua and orange – a girl after my own heart! What a pleasure to be on the Fall 2015 home tour with you!! Love Love every bit of your home! Aqua and orange is one of my favorite color combinations. Love your colors! 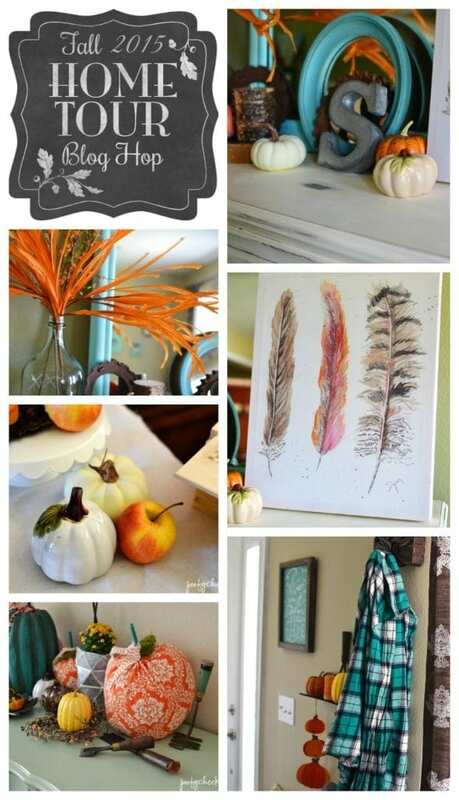 That feather print is awesome and I love your eclectic pumpkin patch! Kelsey, I loved touring your home. My favorites are the feather print, the he hanging rake, and what a clever idea for drawer pulls on your chest of drawers. The color scheme of aqua and orange really works well together. Loving the teal with the orange for your Fall Decor…It all looks great and the rake self is so cute…great way to display your pumpkins.